But, lets look at the wider context of the meaning of common mode current when a uniform coaxial line is connected to an antenna system. Whilst an antenna might have an obvious two terminal connection to the feed line, in the presence of ground, the current in those two terminals are not necessarily equal and opposite. Expanding on the explanation given in Common mode current and coaxial feed lines. The diagram above shows the case at the end of the shield where two conductors connect the antenna load to the coax (eg to each leg of a dipole). In an antenna system in the presence of ground, I1 need not equal I2, and it can be seen that when I1 is not equal to I2, there is a current I2-I1 that flows on the outer surface of the outer conductor, this is the sum of the common mode components of the currents I1 and I2. Kirchoff’s Current Law is satisfied at the node denoted by the black dot, the sum of the currents into the node is zero. As in the general case I1 and I2 are not necessarily equal (the , we can consider them to be the resultant of the sum of differential and common mode components (Id and Ic) such that I2=Id+Ic …(1) and therefore that I1=Id-Ic …(2). If we add eqn 1 and eqn 2, we get I2+I1=(Id+Ic)+(Id-Ic)=2Id, or Id=(I2+I1)/2. If we subtract eqn 2 from eqn 1, we get I2-I1=(Id+Ic)-(Id-Ic)=2Ic, or Ic=(I2-I1)/2. The diagram shows the current flowing out the outside of the shield to be I2-I1 which is 2Ic, it is equal to the sum of the common mode current of each of the currents I1 and I2, and there is no differential component in the current I2-I1. We can say that the current on the outside of the shield is entirely due to common mode current and is equal to the sum of the common mode components of currents I1 and I2, ie the total common mode current. Returning to the definition of I1 at eqn 2, I1=Id-Ic and since the current on the inside surfaces of the coax is I1, it includes Ic, the common mode component of current I1 on the right hand side. 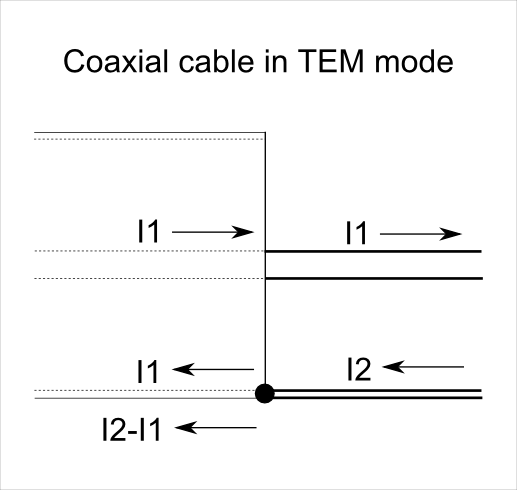 Whilst it is true to say that the interior of coax in TEM mode only supports differential current, the current I1 was is carried purely in differential mode inside the coax, itself includes the common mode component of currents I1. I1 includes 50% of the common mode current Ic that flows on both sides of the diagram. The latter is a mechanism by which locally sourced noise currents induced on the outside of the shield effectively contribute to noise delivered to the receiver. common mode current contributes to radiation when transmitting and to signal and noise capture when receiving. It is true that braided shields are less perfect that metal tubes, and through braid leakage does occur in such cables, though braid coupling is typically well under -20dB, -30 to -50dB being more common. The mechanism described in this paper is not through braid leakage and the coupling factor from outer surface of the coax shield to inner conductor is -6dB at the shield end.